Today’s eCommerce environment is like a loud marketplace with countless vendors grappling for consumers’ attention. The challenge for online businesses is to stand out in the crowd. Like any eCommerce business, you’ve got to find a way to cut through the noise and be heard by your customers. Implementing visual marketing as a key part of your eCommerce strategy, engages your customer base and boosts conversions. 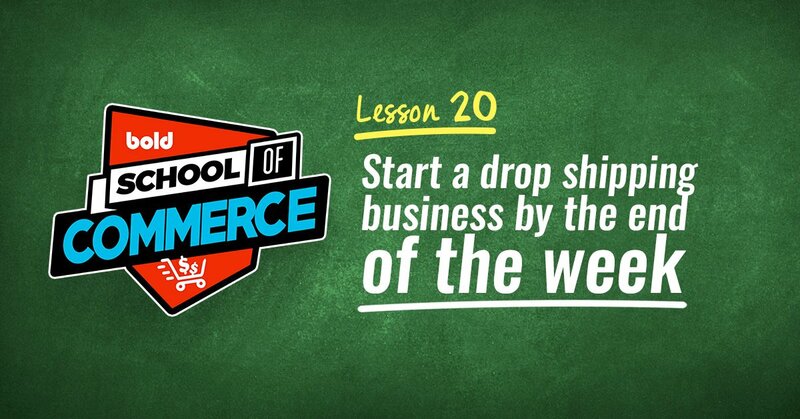 Visuals grab your shoppers’ eye and garner more interest than plain text. Here are five actionable tips to maximize visual shopping so you can drive sales and engagement for your store. 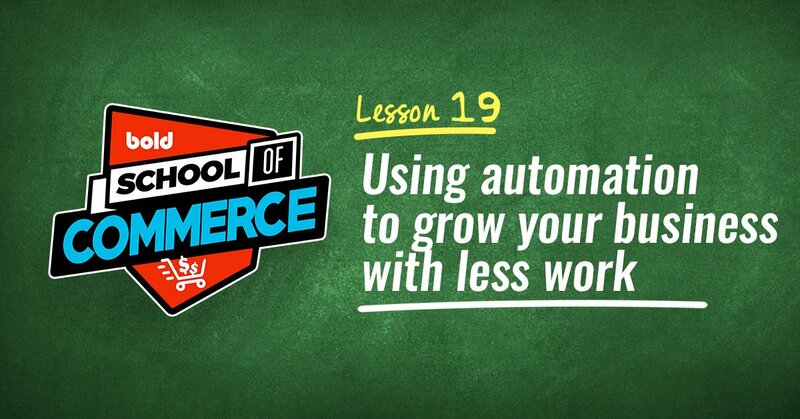 So what is visual commerce, anyway? Visual commerce is the strategy of using visual elements like photos, videos and 360-degree views to pique consumer interest, efficiently communicate relevant product information, and ultimately convert shoppers into buyers. The goal is to use the visual tools at your fingertips to create the best online shopping experience you can for your customers, and that includes customer content. 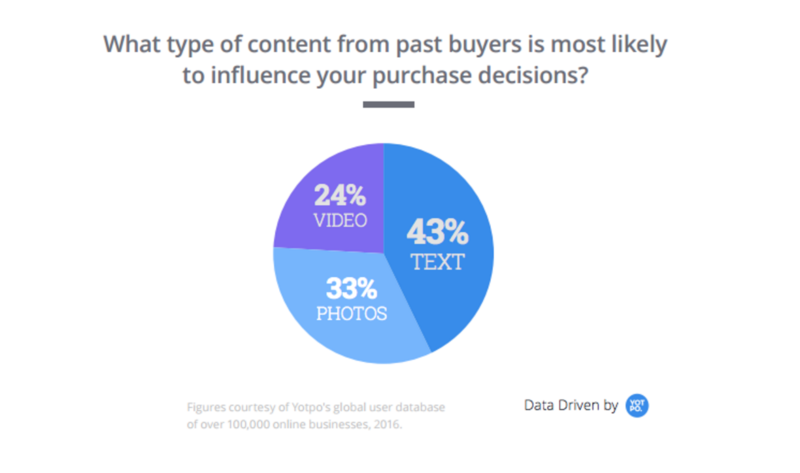 Shoppers trust customer content like user-generated photos and reviews over branded content. And when it comes to customer content, the influence of photos and videos is definitely on the rise. As shown in the graph below, authentic reviews are still on top as an individual type of customer content, but 57% of shoppers say they are most likely to be influenced by visual customer content when making purchase decisions. 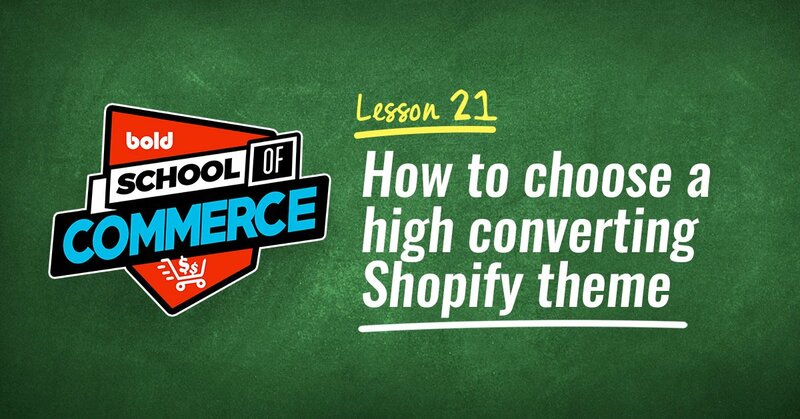 So the question is not whether to implement visual commerce, but rather how to use it to your store’s advantage. Social proof is a term that describes people’s tendency to assume and learn from the actions of others. For example, if you see someone get burned by touching a hot pan, you are not going to touch that pan yourself. Applied to eCommerce, this means that seeing other customers using a product is more likely to influence consumer behavior. If you see someone wearing a cool watch, maybe you’ll want to buy it, too. User-generated photos on and off your site are an effective way to leverage social proof. When potential customers see products being used by past buyers, it enables them to visualize the product in their own hands. For example, these Instagram photos on Brathwait’s homepage allows shoppers to imagine having these watches be a part of their day-to-day life. Honing in on the authenticity of a previous buyer’s photo elevates social proof and creates aspirational content. This allows companies to express their values through content that encapsulates the very essence of their brand. Using aspirational content helps build consumer trust and establish brand authenticity by letting your customers be your voice. User-generated photos increase engagement and conversion on your site, and can also be repurposed across marketing channels. Ultimately, using organic user-generated photos, from Instagram for example, increases conversion rates by 25%. 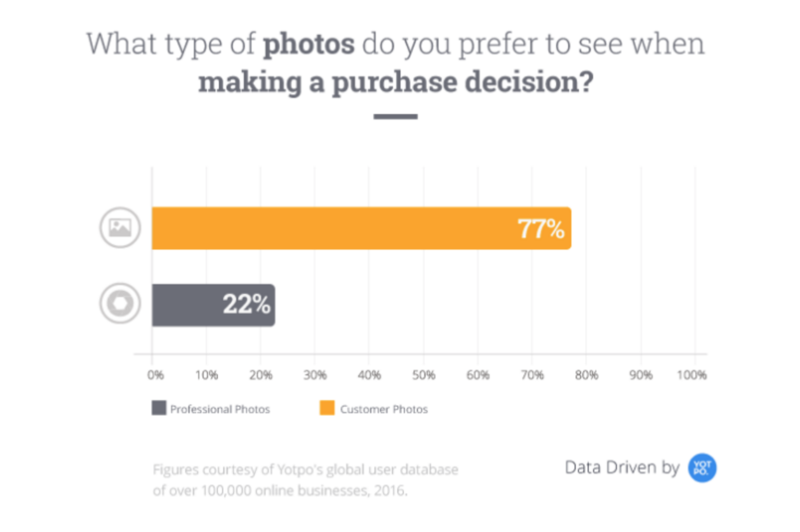 In fact, 77% of consumers say that authentic photos from real customers affect their buying behavior more than professional photos from stores do. Now that we’ve established the value of user-generated content in your visual commerce strategy, here are some ways to go about collecting relevant content. You’ll need to encourage ongoing contributions from your existing buyer base. But how? Employ a consistent hashtag across your store and social platforms in order to continually collect customer content. Make it easy and familiar for your customers, so they keep using the hashtag and continuously generate relatable visual content. Use creative Instagram campaigns to get existing customers to post candid pictures of themselves using your product in their daily lives. The less posed, the more reliable it feels. Another way to spark UGC is by reaching out to buyers and simply requesting a review or rating with the option to append their own image alongside it. You can collect user-generated photos and videos and repurpose them throughout your marketing materials. Connect your social content straight to your eCommerce store. 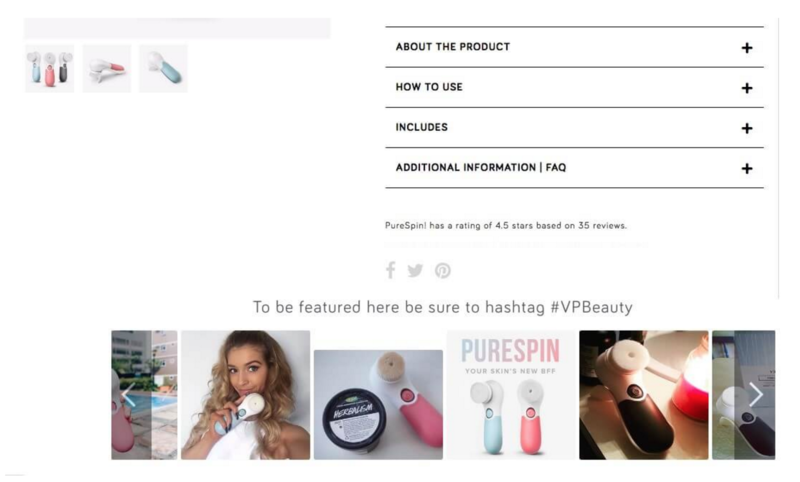 Shoppable Instagram means having an Instagram gallery on your site, and every photo you click on can link straight to the product page of the tagged items. Instagram is a powerful tool that needs to be harnessed to redirect your followers straight to your store. 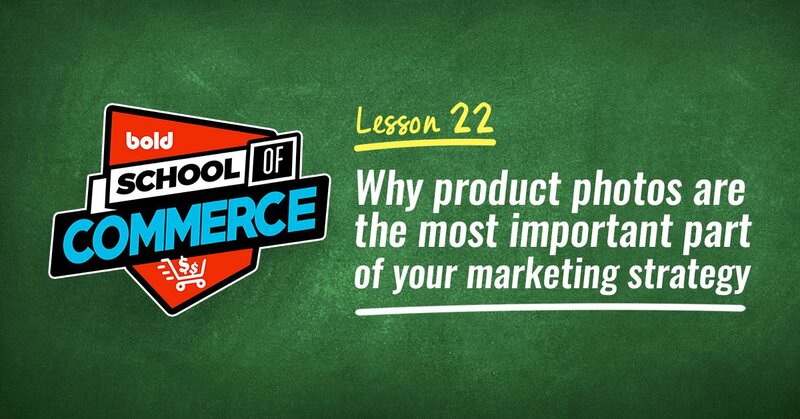 If they see a product they like in a photo, you want to be sure that they go right ahead and buy it. Instagram’s research shows ad recall from Instagram sponsored ads is 2.8x higher on average than ad recall from other social networks. That’s probably why 30% of Instagram users have purchased a product they found on Instagram. Use a visual commerce platform to make your Instagram completely shoppable. You can see below how Rhone does a great job collecting instagram images with the hashtag #wheninrhone and then making the product shoppable directly from the image window. When selling with Instagram your content can be extremely targeted. Instagram allows you to show your ads to exactly the people who would want to see them. So, if you’re going to spend money on ads, you need to know that the ads are going to be seen by the right audiences. Don’t overlook the fact that adding Instagram photos can boost check out by an astounding 24%! Once you have user-generated photos in the mix, you can combine organic Instagram photos and create a versatile and aesthetic gallery for customers. This is a great way to engage your customers because they are immediately drawn in by the power of social proof via peer-to-peer photos. Dedicate a page on your site or space on the product page to display all the visuals you have: Instagram photos, UGC photos and product photos--all in one place! You can show off your variety of images with an image carousel or collection page feed to keep customers exploring on your site. Check out MVMT’s powerful use of both product and Instagram photos that allows potential buyers to verify what their watches look like on real people. 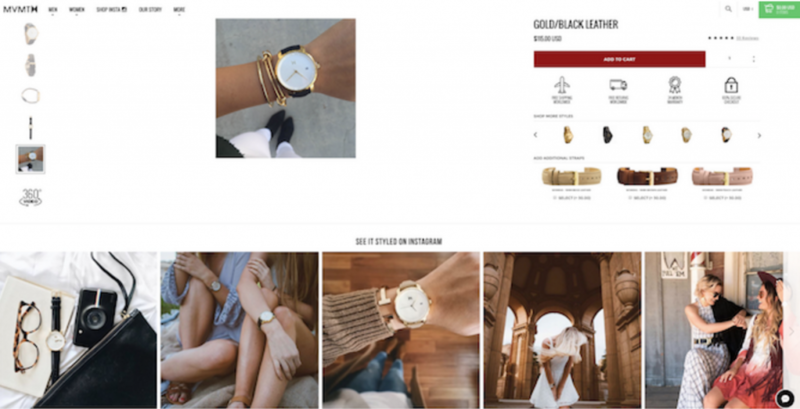 By mixing UGC in with product pictures and including an Instagram feed featuring relevant social content on each product page, MVMT allows shoppers to better understand the proportions of the product and imagine how they would style it themselves. Ultimately, this is what truly convinces a shopper to make a purchase, much more than a product description. 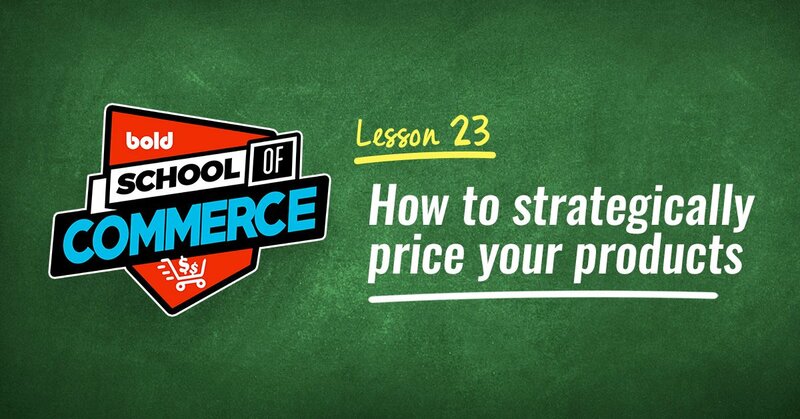 First you have to understand the power of visual commerce to use it. Then you’ll want to incorporate many different forms of visual elements to maximize social proof, boost engagement, make your site more interactive and ultimately, drive sales. By integrating user-generated photos and Instagram photos, you’ll make your products more shoppable and your site more exciting for consumers.